Photonic Healing, LLC warrants its light to the original owner of the AAH Light against manufactures defects in material and workmanship for the LIFETIME of the ownership. 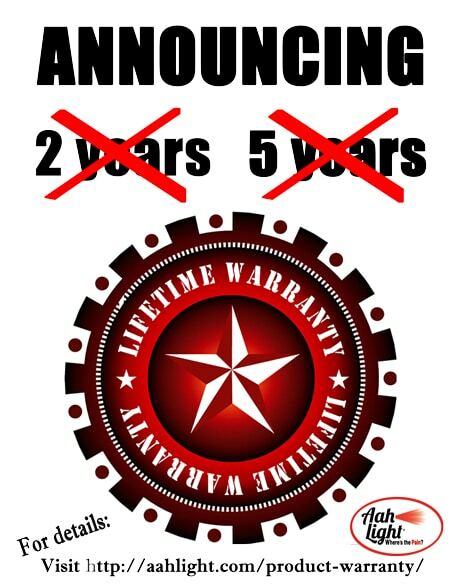 This warranty will grandfather all lights purchased after January 1, 2014 and is for conditions of normal use and service and will require proof of purchase. Please note, the toggle switch carries a one-year warranty and the battery and battery charger carry a 90 day warranty. You should fully charge the battery with the charger provided prior to use and once a month out of regular maintenance. Photonic Healing, LLC, will determine whether the product is defective or damaged. The exclusive remedy for a defective product will be to repair or replace the defective part, as needed, at Photonic Healing, LLC’s option with no cost to the original owner. It is the duty of the customer to obtain a Return Authorization number, cover the return shipping and return defective unit to the factory for repair or replacement. If it is determined not to be a warranty issue, return shipping is the responsibility of the customer. This warranty does not obligate Photonic Healing, LLC to any liability for secondary charges, expenses, or any other consequential losses. The company’s maximum liability shall not, in any case, exceed the cost of the defective part that is repaired or replaced. This warranty shall not apply to any product, in whole or in part, that was repaired, altered, or tampered with in any manner outside of Photonic Healing, LLC’s factory. The warranty is void on products that are damaged or broken or that were used in a manner contrary to the product’s intended purpose. Batteries used that were purchased and used other than from Photonic Healing, LLC may void the warranty. Please check with the office prior to using other brand batteries. Photonic Healing, LLC shall not otherwise be liable for loss or damages, whether direct, indirect, special, incidental, or consequential, regardless of the legal theory asserted, including negligence, warranty, or strict liability. Buyers are responsible for any shipping charges incurred when returning a defective item to Photonic Healing, LLC. Items must be returned prior to warranty replacement items being sent back. If (after the item has been returned and examined by Photonic Healing, LLC) it is determined that the item is not defective but was mishandled or altered, no warranty repairs or replacements will be made. Photonic Healing, LLC will cover the cost of return shipping to the buyer for all warranty items. The buyer, whether domestic or international, is responsible for any shipping charges incurred for the return of all non-warranty items.